This large house, built in the Samnite period in the second half of the 2nd century B.C., must have belonged to Marcus Epidius Rufus or Marcus Epidius Sabinus, to judge from the number of times these two names appear in the election propaganda on the façade and on the walls of the neighbouring buildings. Outside, a two-step podium runs along the façade, an unusual architectural feature. Beyond the entrance vestibule is an atrium of Corinthian type of an imposing size, with sixteen columns with Doric capitals set around the impluvium basin in the centre. 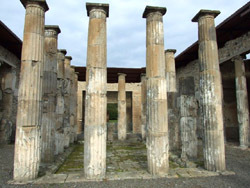 This is the most striking of the rare Corinthian atrium in Pompeii (in other words with a row of columns set along the side of the impluvium). All around were various rooms, but unlike the canonical scheme, here the ‘alae’ were at the centre of the side walls instead of at the back. They were preceded by a pair of Ionic columns and the corners piers had capitals with the heads of maenads or divinities. In the ‘ala’ of the northwest side there is a shrine which the dedicatory inscription on the podium tells us was erected by two freedman named Diadumeni in honour of the Lares and the Genius of their master Marcus, certainly one of the two public personages cited above.